Save $100 and get FREE Shipping in Canada for a limited time. Why use Quilters Dream Batting? 100% premium batting. Unmatched quality. Quilters Dream is made with the highest grades of upland U.S.A. natural cotton. Special microfibers give it unparalleled drape, soft hand, breathability, and silky comfort. Top quilters love Quilters Dream. Top "sewlebrity" quilters such as Angela Walters use Quilters Dream exclusively, and rave about it being their favourite! Convenience of a full roll on hand. Save money and time spent driving to the store when you run out of batting. A full roll in your sewing room is super convenient! The most popular batting types. Quilters Dream Select is the most popular loft. The perfect batting for most quilting projects, mid-weight drapeable quilts and wearables. Quilters Dream Blend was designed specifically for Machine Quilting. The highest grade of USA cleaned natural cotton is blended with silky fine denier polyester microfibers. These perfectly blended fibers are carded and cross-lapped for a smooth, consistent web that is layered on to a light scrim and specially needle-punched. 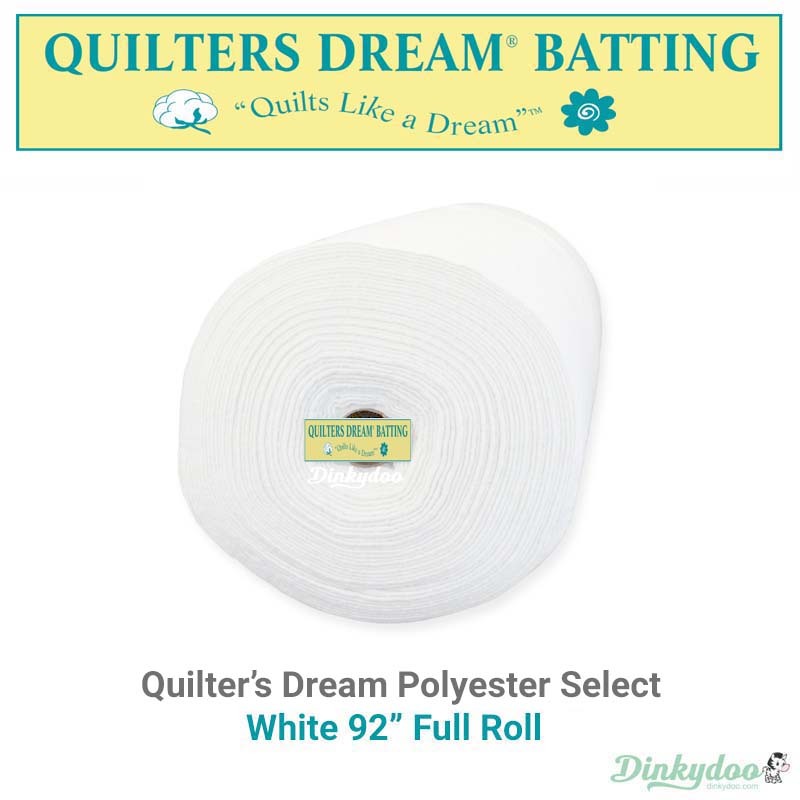 Quilters Dream Poly is the best Polyester you can get! This premium Poly contains very fine denier, high quality fibers. Over 60 million microfibers per pound (compared to 5 million for other brands!) This is a high end polyester batting product. Has a soft, lovely drape. 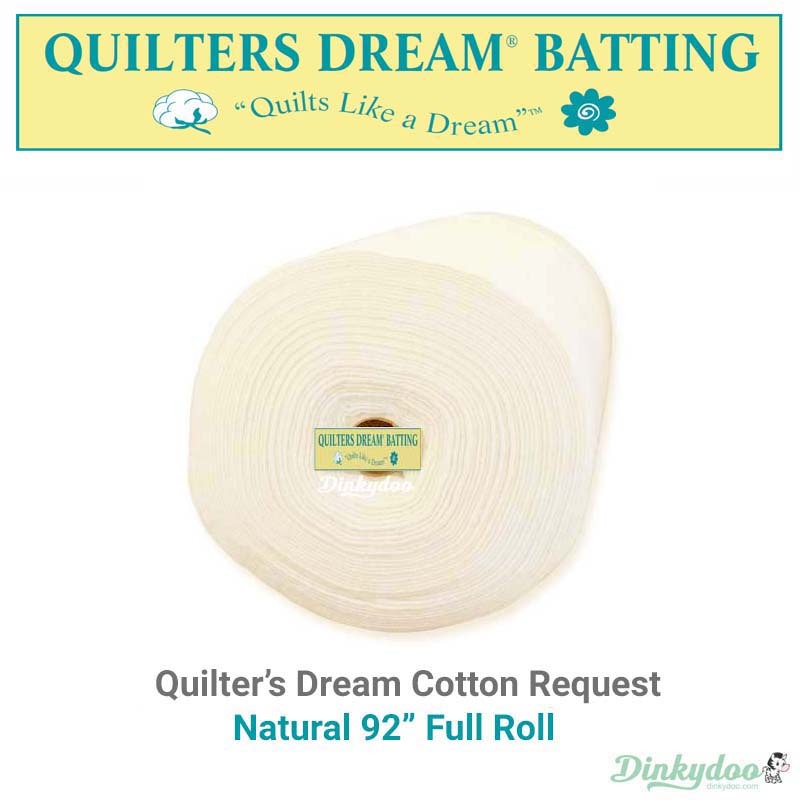 Quilters Dream Request is a lightweight and consistent batting developed especially for hand quilters. Best for fine micro-stitching with an excellent drape. Can be used on the longarm when floating the top. This batting is my favourite, hands down. While I have occasionally tried other 100% cotton battings from various manufacturers I always come back to Quilters Dream. It is soft, easy to work with and I've had other quilters ask what batting I use because of the drape and softness. I can't recommend this stuff enough. Awesome batting I love the feel and the way it handles. This is my all time favorite. Fantastic Batting! This cotton batting is fantastic! It suits machine or hand quilting. There is almost no shrinkage after machine washing and drying. Great product! Quilters dream wool batting This wool batting is terrific. It maintains loft after quilting. Beautiful to work with. The warmth it provides makes an especially cozy quilt! Excellent dream wool batting . I love the 1/3 “thickness and the way it drapes. I've only used Hobbs batting before. How is Quilters Dream comparable? Quilters Dream is condensed a bit more, a little thinner (in a GOOD way), very smooth and even, and has great consistency. It is simply amazing to quilt with. 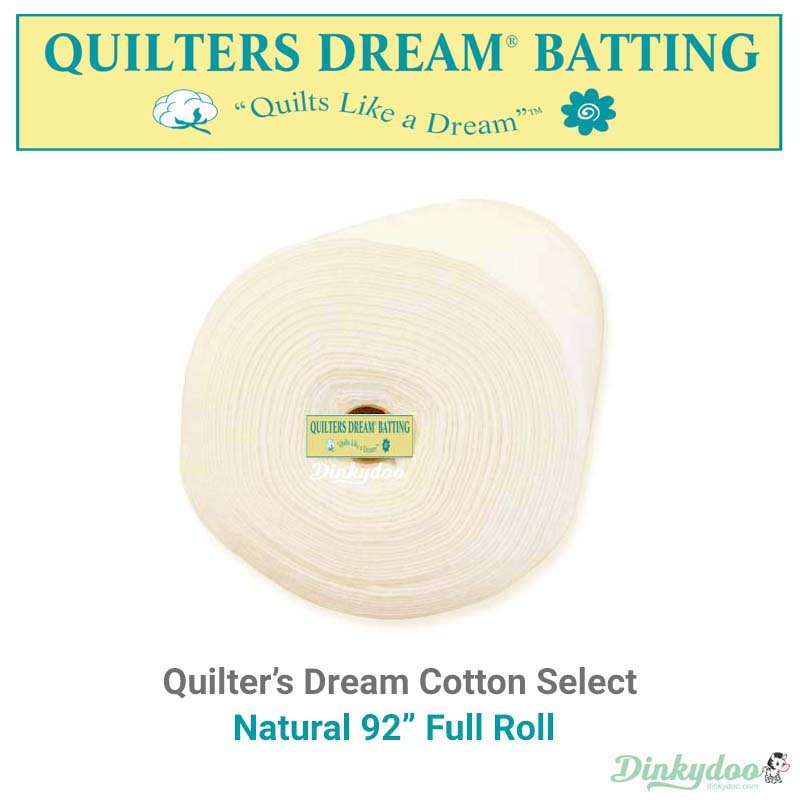 Is Quilters Dream Batting made in the USA? What is needle punched batting? Needle punched batting has fibers that have been carded and put through a machine that punches the fibers down with thousands of needles to keep them in place. This makes it very stable and durable. Dream Wool and Dream Puff battings are thermally bonded. This means the fibers are blended with a low melt poly fiber as a bonding agent. This process prevents bearding, shifting and shrinking. Scrim is a very think polypropylene sheeting that is needle punched into the batting. This provides extra stability. 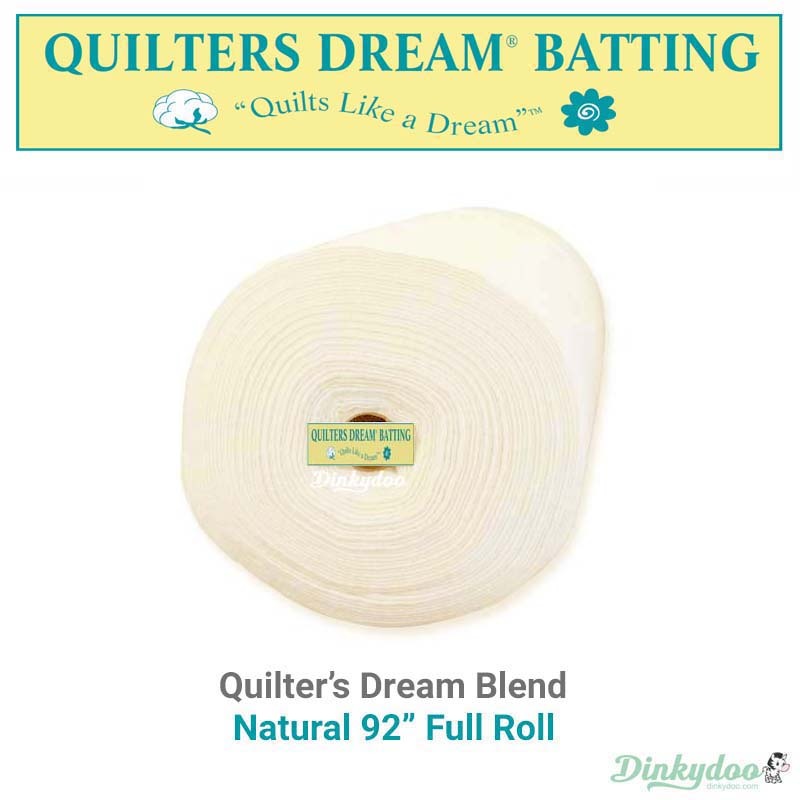 Dream Blend is the only Quilters Dream batting that has scrim. Scrim provides extra support for tugging and pulling the batting when used on a longarm machine. Because of the scrim, Dream Blend will not stretch or leave handprint marks when pulled. Are resins or glues used in Quilters Dream? No quilters dream batting types contain resins or glues. Do I need to prewash Quilters Dream batting? No, it is not recommended. If batting gets wet, it becomes heavy and can stretch and fall apart. The quilting gives the batting the support needed for years of washing without bunching or shifting. Quilters Dream uses very high quality clean fibers, so you do not need to wash or pre-shrink it. How far apart can I quilt with Quilters Dream batting? Please see this batting guide from Quilters Dream outlining all these details and more.